Rusty has arthritis, moves slow, falls asleep early – and so do many of the members of his wonderful new family at Rockland Place. Rusty, 8, has arthritis and moves slow. He’s asleep at 6 p.m. most nights. And it would seem that at last, this sweet shelter dog has found precisely the forever home he was meant for in Rockland Place. The Rockland, DE, retirement home offers assisted living and memory care. Negron first met Rusty, a boxer mix, back in November when she made visited Faithful Friends Animal Society to donate supplies. 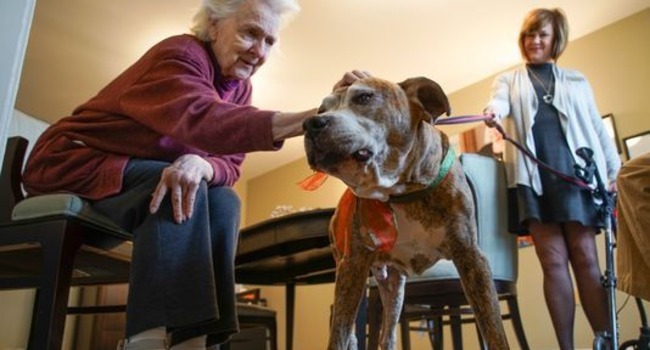 The society’s Executive Director, Jane Pierantozzi, suggested that Rusty would make a great addition to the retirement community, which had never had a dog before. After talking it over with her staff, they agreed to give it a try and before long, Rusty was walking the halls of Rockland Place alongside residents. “It was hard not to fall in love with him,” Negron, a dog person, said. One trip became another and another. The residents were soon looking forward to his visits — as was Rusty, who enjoyed the excessive treats and slyly slipped table food from his new friends. Always, though, Negron would return him to Faithful Friends’ shelter. But two Fridays before Christmas, she found herself unable to leave him when he tried to follow her back out the door. And he’s spoiled and happy. Resident Georgie Cole loves giving Rusty treats and patting him on the head. Rusty returned the praise with kisses for Cole, his green-and-red bow swinging around his neck. Soon, Rusty will have free run of the place. The same tech that keeps the memory patients from wandering off will keep Rusty safe inside, as well. Doors automatically close and lock when he gets too close, and Negron said Rusty will be able to sleep in the rooms of residents as he wishes. For many, he’s the perfect way to make Rockland Place feel like home. Newfy Lovers: This Video’s For You! All retirements homes should have a dog or two. It’s good for everyone!